We knew we had to go to Bangka ourselves. 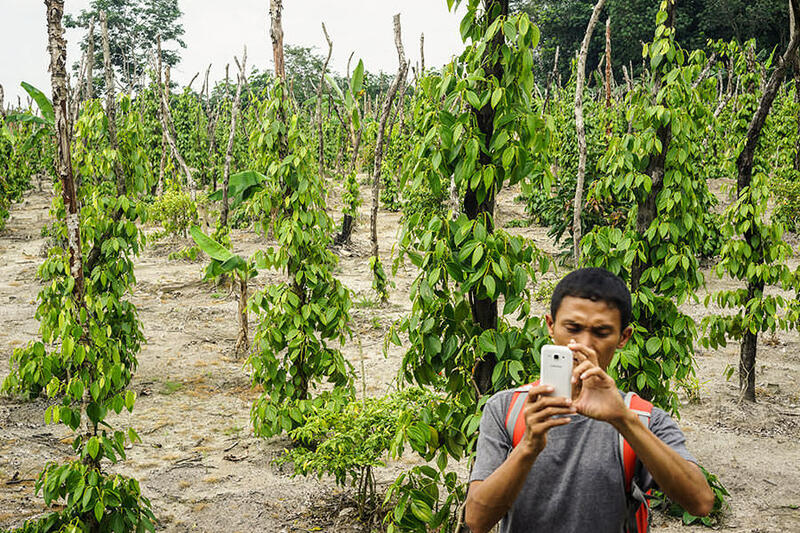 We knew as soon as our friend and apprentice spice hunter, Ihsan, told us how difficult it was becoming to get good white pepper in his hometown, Padang, in West Sumatra. Ihsan had gone to Bangka island on his own last year but was confronted with obstacles put up by stubborn traders who wanted nothing to do with a young man they didn't know and who they decided had no business in the pepper business. Bangka island is just off the eastern coast of Sumatra and it seemed so exotic to us that even the pronunciation of Pangkal Pinang, the capital presented linguistic challenges. Ihsan mentioned having spoken briefly to Herru, a man he had contacted on his previous trip, so we felt that getting in touch with Herru would be the obvious place to start our excursion. He was the only person we "knew" on the island, so we unanimously elected him our point man. We met our only friend on the island in his office at the daily newspaper, The Bangka Pos, soon after our plane landed. We explained as best we could, our quest for what we considered one of the best white peppers in the world. 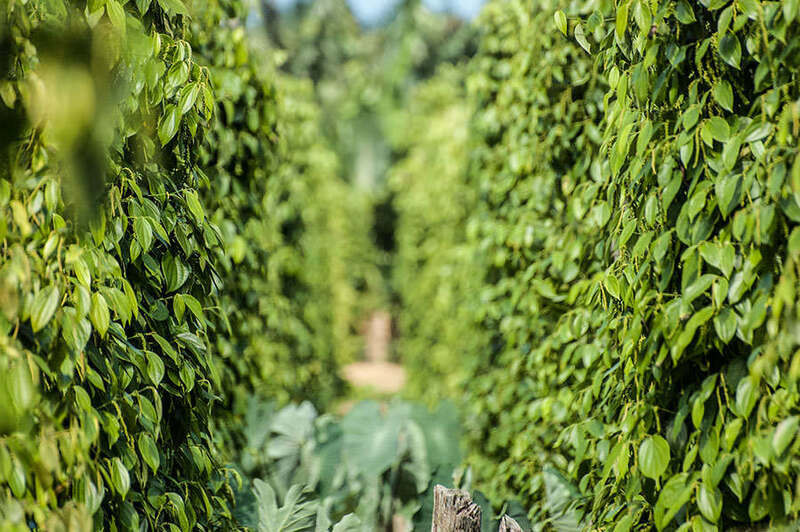 Herru admitted knowing very little about pepper production on the island, except for the fact that more farmers were returning to growing the spice since tin production, which had dominated the economy for many years, was beginning to lose its appeal. The physical and general health casualties among miners were escalating and the environmental devastation due to strip mining was becoming increasingly catastrophic. Herru was generous, and extremely curious about us. We quickly realized that this was in part because very few travellers ever visit Bangka. 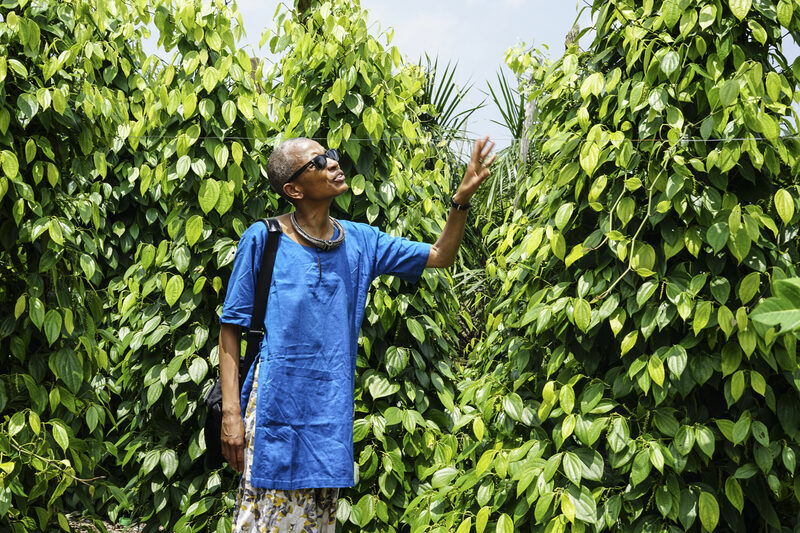 He agreed to introduce us to the only contact he had in the industry - a school director who had recently embraced the pepper planting renaissance when he realized that a productive plantation had the makings of a lucrative retirement plan. 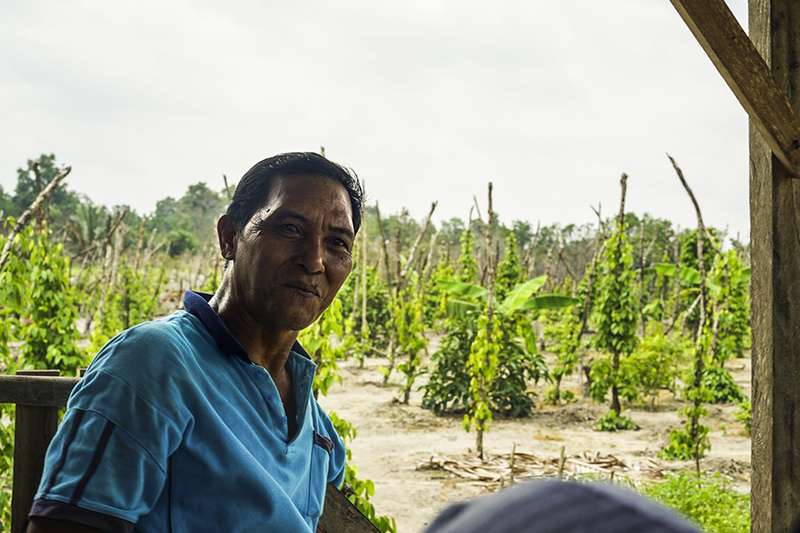 The director in turn introduced us to a couple of farmers he knew; Mr. Yantono and Mr. Haji. Mr. Haji, from all appearances, was the more successful of the two. After he made a small fortune in tin mining, he too had recently embarked on the more sustainable pepper farming band wagon to which he applied his Midas touch. We liked Mr. Haji's pepper, but it was Mr. Yantono's crisp, hot corns that really got us worked up. Mr. Yantono had the good fortune of having a free flowing river right next to his plantation, which allowed him to soak his ripe pepper berries - once bagged - in the river. 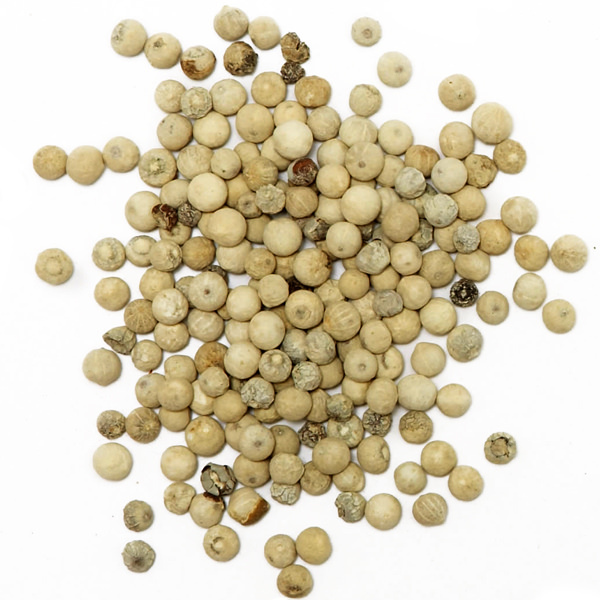 This facilitated the all-important task of removing the outer husk of the peppercorns, allowing for optimum fermentation, which ultimately determines the quality of the finished product. It is only once the berries are placed in fresh, clean, flowing water, then properly sun-dried, that they eventually morph into peppercorns that don't smell or taste like a barn yard. Mr. Yantono's crop sample from last year - albeit not his premium grade - left no doubt in our minds that he truly mastered the technique and art of exceptional, single-estate, white pepper production. 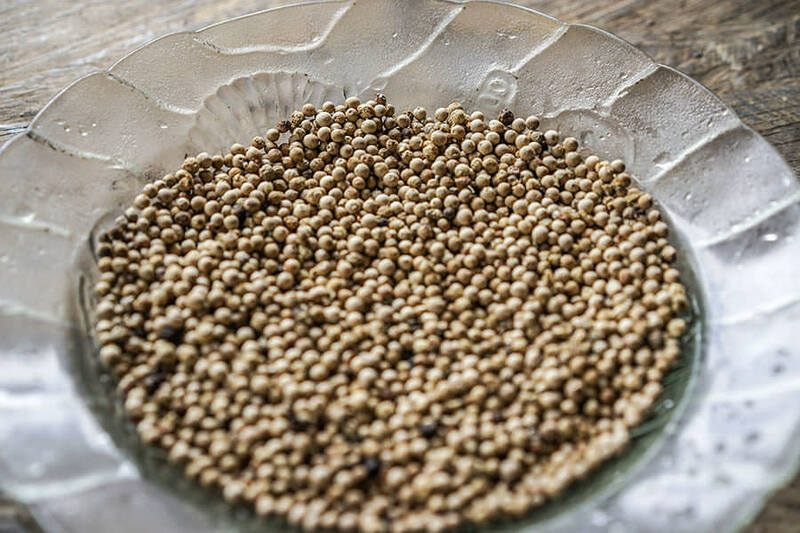 It is impossible to ignore the fact that it is thanks to the ancestral knowledge and practices in places like Bangka throughout South east Asia, that we learned how to transform perfectly ripe peppercorns into white pepper. This product so intrigued the Dutch that they went on to monopolize the trade of this most sought-after commodity, which they called Muntok after the harbour from which it was transported beginning in the 18th century. We witnessed the planting of pepper seedlings and were able to evaluate the progression of soon-to-be harvested vines. Some preliminary business discussions were conducted and we even had the pleasure of meeting a very progressive, local senator who had a genuine interest in helping farmers, and was therefore intrigued by what he considered our "novel and equitable approach". We were interviewed by a colleague of Herru's, we hung out with planters and basically went about setting the table for Ihsan to return in August, in time for the harvest. With some luck, by next autumn Mr. Yantono's premium white pepper will be on our store's shelves and will in turn become an integral ingredient in our spice blends. We are certain that everyone will eventually come to understand and appreciate what we're so worked up about. It's no easy task trying to establish direct links with farmers in our effort to give them their due. Traders, collectors and agents have created and continue to nurture lucrative roles for themselves, and unfortunately farmers still do not profit as they should from this antiquated and inherently unfair system. We feel that we got very lucky on Bangka. Herru's assistance was immeasurable and it would appear that his curiosity about us was contagious. Just before our departure he confided that shortly after our visit to his office, he received a phone call from the local military police who wanted to know "exactly what are they up to". He neglected to mention if they were Dutch. Ethné de Vienne was born in Trinidad, so spices and cooking have always been a part of her life. She worked in fashion for many years before finally building the renowned Montreal catering service with her husband Philippe. Today, as a full-time spice hunter, she takes great care in maintaining Épices de Cru’s relationships in its vast network of suppliers around the globe. She’ll never deny that any dish can be improved by a little cumin or zaatar, and probably a nice glass of rum!